More robbers than Cops tonight really. Just finished watching The League of Gentlemen which arrived from Amazon today. 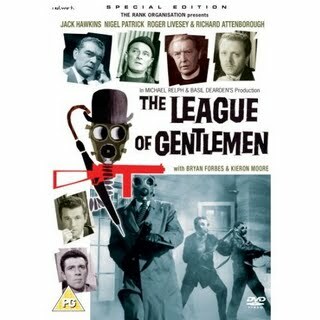 Not the situation comedy but the film from 1960 that the series took its name from in which Jack Hawkins and a hand picked crew of ex soldiers stage a bank robbery. The focus is on the build up to the main heist and builds the tension gently along the way. The ensemble cast are nicely drawn by a cast including Richard Attenborough and Terence Alexander. The score is in the style of classic British war films and some of the montage sequences also remind me of the sequences found in 1940s war films. But this is a film with its feat planted in the 60s. I’d only seen it on afternoon TV before and there were some subtle cuts to the version I’d seen before. Jack Hawkins swears, we see the dirty magazines one of the crew is selling for a living and their are oblique references to one of the crews sexuality. While not a laugh a minute comedy there are humorous moments. The League of Gentlemen certainly isn’t a gritty social commentary. I’ve always thought the ending is a little rushed and the outcome a little weak however the process of getting there is enjoyable.